Westerns. One of the most enduring and mythic genres that the world has ever seen. But what makes them so popular? Is it their ability to pit man against wild? To tell stories of how civilization overcame the wild, untamed frontier? Or is it all those lovely, lovely hats? On this trip I will be journeying through the history of Westerns, and sharing my thoughts on them as a relative newcomer to the genre, so sit back, relax, and chew on some tobacco. This is Richard’s Western Odyssey. Enjoy! 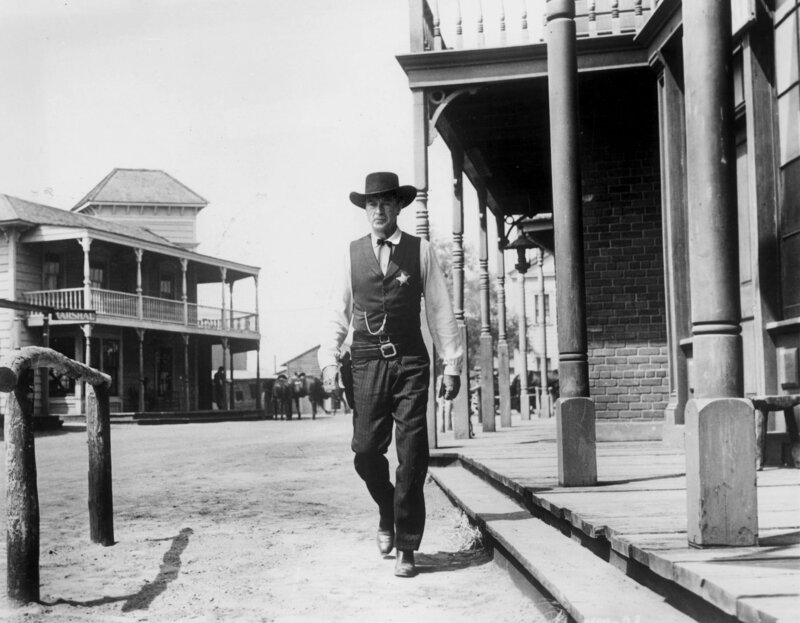 High Noon is unlike any other western I have seen. A tale of desperation, it has Gary Cooper as Will Kane, a Marshall on the brink of retirement. On his wedding day he learns that Frank Miller, a man he once put in jail, has been released and is on his way to exact revenge on Kane with the help of his gang. Told in mostly real time over 85 minutes, the desperation comes in the form of Kane seeking out any person brave enough to fight and defend the town with him, but he is sadly out of luck. Bar one person (who quickly departs after discovering that Kane couldn’t find anyone else), everyone sees it as Kane’s problem. They decide that it would be better for both Kane and the townspeople if he left before Miller and his gang get to the town. Overall I loved this movie. It’s incredibly taut and pacy, mostly due to its brief run time. However, despite it being only 85 minutes long it manages to get out a good deal of story and interesting characters, the highlight of which is Cooper himself as Will Kane. Torn between the love of his new Quaker wife (played here by a young Grace Kelley) and the responsibility he feels to his town, gives us a character who’s reasoning we understand, even if we don’t agree with it. His performance is pretty great, with it winning him an Academy Award in the process. And this is all without even talking about the context in which this film was made. It was made in the “blacklisting” period of Hollywood, and as such the theme of “one man versus his wider community” is evident. 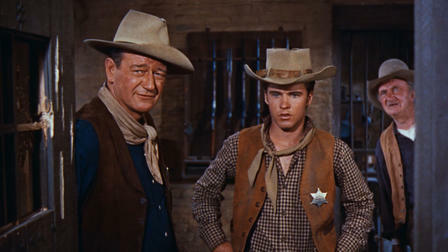 Which is where John Wayne and 1959’s Rio Bravo comes in. Rio Bravo was conceptualized as a response to High Noon, which Wayne referred to as being “un-American”, with director Harry Hawks going on to say that he “didn’t think a good sheriff was going to go running around like a chicken with his head cut off asking for help”. 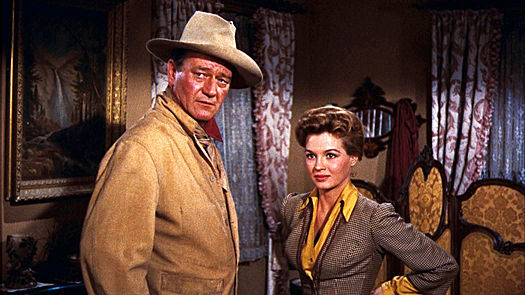 Their intent with Rio Bravo was to make a film similar to High Noon, but instead with a hero character who has no inner conflict and has no problem recruiting people to fight with him. The result is a functional, sometimes fun and enjoyable, but fairly basic western. The plot is simple: after arresting the brother of a local rancher, Sheriff John T. Chance (Wayne) must hold off the rancher’s gang with the aid of his alcoholic friend, a young gunfighter, and his Deputy, an elderly man named Stumpy. The film is interesting up to a point, especially the first half, notably the sequence with Wayne and his alcoholic friend patrolling the town, unsure of who or what they’re looking for, fingers twitching, not knowing if whoever they’re looking for will shoot first. However, the film soon loses steam. At 141 minutes it feels far too long, and could easily do with twenty or thirty minutes being cut. Whereas High Noon was content with telling one story well over a shorter of period of time, Rio Bravo opted to tell a similar story badly over a much longer running time, which results in a baggy, overlong, partly enjoyable film. 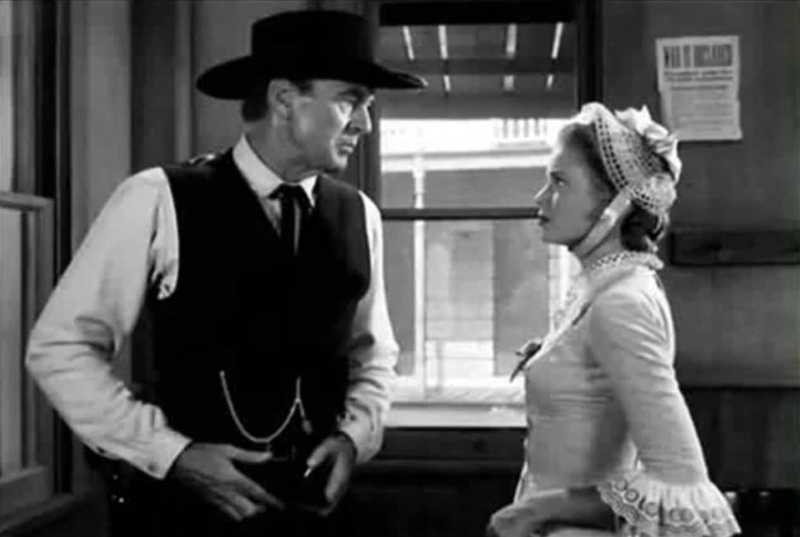 So of these two I much preferred High Noon. Far superior set up to Rio Bravo, much more interesting characters, and that 85 minute run time really is a bonus. Next time I’ll be writing about 1950’s Winchester ’73 with Jimmy Stewart, and 1956’s The Searchers, which I’ve been told is the greatest and most influential western of all time. So that should be good.